You're doing your part to make sure your company is environmentally friendly. Your building is LEED (Leadership in Energy and Environmental Design) certified by the U.S. Green Building Council. You've implemented a recycling program, made changes to the products your company uses, and in general are trying to be aware of your overall environmental impact. But you know there's so much more you could be doing. Where do you start? How do you maximize your building's green potential? There's one very simple way to increase your environmental consciousness dramatically, and that's by choosing the right cleaning service. ISSA, the World Cleaning Industry Association, provides a Cleaning Industry Management Standard (CIMS) certification for janitorial companies that meet a rigorous set of requirements relating to their management structure, operations, and overall quality of service. 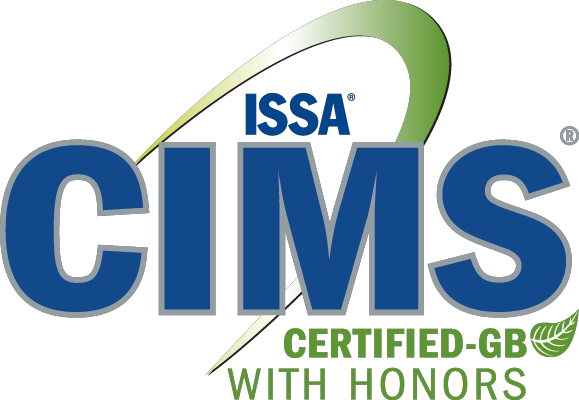 Employing ISSA CIMS certified companies ensures that every aspect of the service you receive will meet the highest standard of quality. But ISSA also has an additional certification standard, specifically geared towards the environment. ISSA CIMS GB (Green Building) certification not only guarantees a superior cleaning company, it also guarantees one that works to implement environmentally friendly cleaning practices. A CIMS GB company has proven, documented green cleaning procedures in place. And their rigorous environmental standards will carry over to give your company a higher environmental standard as well. Employing green cleaning services can help your building boost its LEED for Existing Buildings: Operations and Maintenance rating (LEED-EBOM), and obtain more LEED points, particularly in the Materials and Resources and Indoor Environmental Quality categories. The ISSA CIMS GB certification is specifically designed with the LEED rating system in mind. A CIMS-GB certified cleaning service is one that knows the LEED Green Building Rating System well, and is proven to be able to work with you to give you exactly what you need to secure more LEED-EBOM points for your building. The points you earn by employing a CIMS-GB certified cleaning service can help increase your LEED certification level to silver (50-59 points), gold (60-79 points), or even platinum (80 points or more). And if you can boost your overall LEED rating, there are all sorts of benefits. A higher LEED rating can mean tax breaks and incentives, fee reductions and waivers, density bonuses, and much more. The ISSA CIMS GB certification takes the hassle out of looking for green cleaning services. You don't have to worry about what a janitorial company means when they claim to be "green," and whether or not they're really able to help you raise your own environmental standard. When you hire a CIMS GB certified company, you know exactly what you're getting, and you know exactly what they're capable of doing for you. A successful green cleaning program and a higher LEED rating have never been easier than with ISSA CIMS GB certification. If you are shopping for Cleaning Services see Stathakis’ newest Ebook, "The 360 Buyer’s Guide to Better Cleaning Services", cleaning industry experts provide key insight into how to navigate through the maze of Cleaning Companies to find the best value for your facility. Get this Janitorial Buying Guide today!